We've just had an exhausting weekend having been down to Leeds for brother-on-law's 50th birthday party. The party was fun, but the monsters did not sleep well and so neither did we. However, I did manage several hours of freedom at the Knitting and Stitching Show in Harrogate. There were lots of exciting things to see and I spent ages talking with different people. I really liked Anita Bruce's knitted evolutionary shapes, all handed knitted in metal, set out like museum exhibits. At a totally different level, Raymond Honeyman's hand painted designs for tapestries were astounding; thousands of little dots of paint on graph paper. As usual I spent more than I intended, this time on beautiful Japanese hand knit yarn from Habu. They are so delicate and some have some paper content or stainless steel, which gives a lovely sheen. I am going to try and knit a jumper with them, which is rather ambitious given my hand knitting skills. It will be several years in the making. Today was my birthday and it was a surprisingly good birthday, complete with 'I am 38' banners made by our eldest son. I was taken out for lunch unexpectedly and am currently having mussels cooked for my dinner. I also received two lovely books. 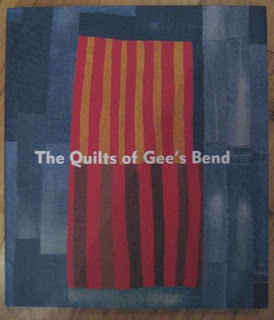 The Quilts of Gee Bend was on my Amazon wish list, though it was still a surprise. I'm looking forward to reading it as well as enjoying the images. The other book was completely unexpected, but was bought because it reminded the buyer of patchwork with the blocks of colour and textures of the bricks etc. It is interesting and I'm going to enjoy perusing it. 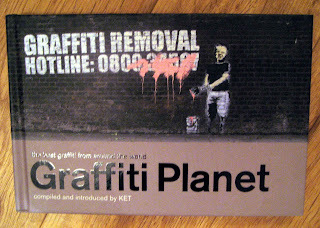 It is also funny as I was going to give the buyer one of the Banksy books of graffiti for Christmas as I like the humour in his work. With my own work, not much was done today for obvious birthday reasons. However, I did receive a lovely new Pfaff sewing machine to try out from the kind people at VSM. It looks amazing and fun, with lots of different stitches to try out for novelty value, but also with lots of useful extras like the automatic feed through and needle down positions. I just need a quiet few days to get to grips with it.... Soon hopefully. Here are some images from my work earlier in the week. The first is the result of digital print onto scrim. It has a lovely translucency to it. The other two are knit. On Monday, it was really successful with no disasters and the black and white piece has felted well. Tuesday was a different matter. Two pieces fell off and this second knit piece looks a bit insipid, but will look great when projected onto, but it not only fell off, it also developed a huge hole on felting. Got to try again on Monday now. So finally, I am getting started. 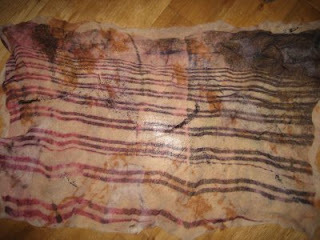 This blog is about my textile practice as it (hopefully) grows and develops. Today I was at Duncan of Jordanstone Art School in Dundee. I had another first, as I gave the first presentation about my work. Apparently my nerves didn't show and the talk seemed well received. 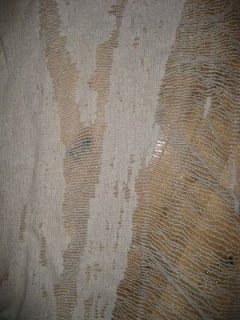 I did some digital printing onto scrim to which I had needled felted some wool tops. The uneven surface didn't affect the printer too much, so I'm hopeful of a good result tomorrow when I can remove it from the backing. I'll add a picture when I have it steamed. 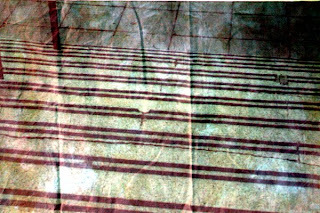 For the moment, this is the image I was trying to print. The rest of the day was spent on the knitting machine and I finally managed to knit a whole large piece without it falling off or running out of yarn. Hooray! 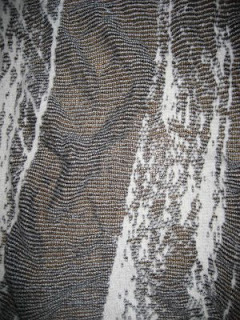 This is the pattern I used. It looks nothing like what the knit will be after I have felted it. If only all days could be as productive as this.